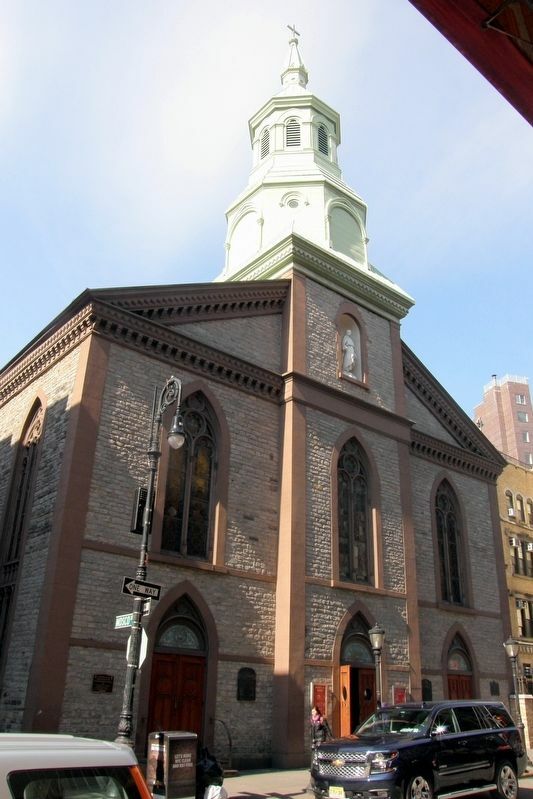 The English Lutheran Congregation built this charming and unpretentious church in 1801 from the same rubble masonry as St. Paul’s Chapel. It is Georgian in style, with the steeply pitched end gables, rich entablature and quoins, and rectangular plan with the tower set forward. The etched window heads, however, are reminiscent of English Gothic parish churches. 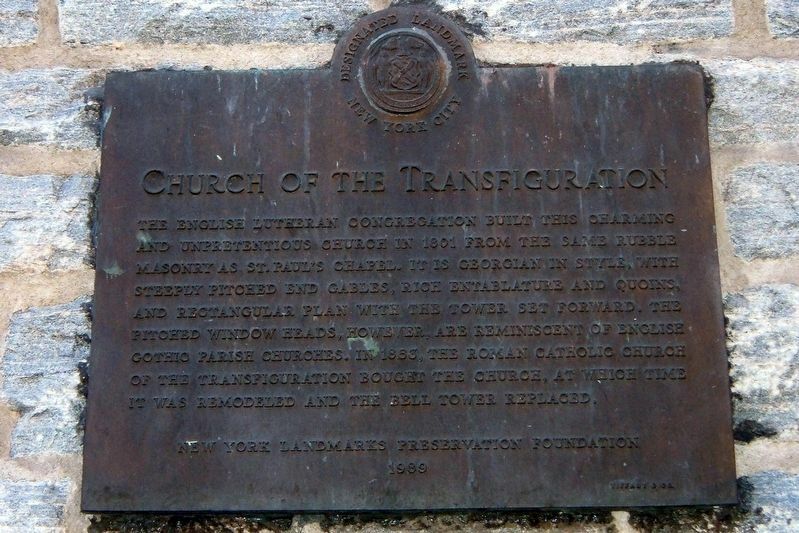 In 1853, the Roman Catholic Church of the Transfiguration brought the church, at which time it was remodeled and the bell tower replaced. Erected 1989 by New York Landmarks Preservation Foundation. Location. 40° 42.883′ N, 73° 59.936′ W. Marker is in New York, New York, in New York County. Marker is on Mott Street near Mosco Street. Touch for map. Marker is at or near this postal address: 25 Mott Street, New York NY 10013, United States of America. Touch for directions. (a few steps from this marker); Roll of Honor (a few steps from this marker); Welcome to Columbus Park (was about 300 feet away, measured in a direct line but has been reported missing. ); Gateway to Old Chinatown (about 400 feet away); Birthplace of Modern Tattooing! (about 400 feet away); NYC’s Oldest Brick House (about 400 feet away). Touch for a list and map of all markers in New York. More. Search the internet for Church of the Transfiguration. Credits. This page was last revised on April 1, 2019. This page originally submitted on March 31, 2019, by Larry Gertner of New York, New York. This page has been viewed 48 times since then. Photos: 1, 2. submitted on March 31, 2019, by Larry Gertner of New York, New York. 3. submitted on April 1, 2019, by Larry Gertner of New York, New York. • Bill Pfingsten was the editor who published this page.